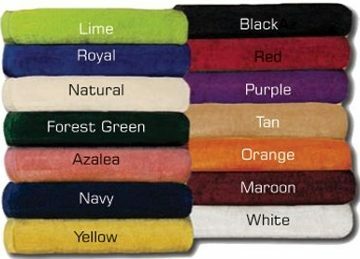 Premium wholesale personalized beach towels in a soft velour finish and bulk blank beach towels. Hemmed and sheared for plush feel and excellent print registration. Made of cotton velour and terry fabric. Lowest prices in the USA and Canada for bulk personalized beach towels. American buyers pay no taxes. SIZE: 30" x 60" - 11 lbs./dozen. COLORS: Black, Red, Royal Blue, Navy Blue, Maroon Red, Lime Green, Forest Green, Purple, Yellow, Orange, Azalea Pink, Tan Beige. Imprint Area: 25" x 50"
Setup Charge: $130.00 per imprint color. Production Time: 10 working days after proof approval. Bulk blank beach towels ship next day. Wholesale Beach Towels Custom Promotional Personalized Embroidered or Printed. 30"x60". Lowest prices in the USA and Canada.